From million dollar deluxe suites to comfortable family living, you'll find Calgary condos for sale range across a full and varied spectrum. Whether you're a first-time buyer looking for a budget-friendly home to call your own, or you're a blooming business executive looking for a refurbished heritage building close to Downtown, there is a Calgary condo out there for you. Condos can be found throughout the city in both townhouse and apartment styles. Start your search for Calgary condos for sale, or uncover more about the different styles of condos within the city. For more than 30 years, Ken Richter has been a trusted name in Calgary real estate. Register with Team Ken Richter for complete access to Calgary condo listings. You'll also be able to use our advanced search features. The homebuyer on a hunt for a Calgary condo for sale will find that there is plenty to explore on the Calgary real estate market. Just off Downtown, buyers will find luxury apartment style condos in highly walkable neighbourhoods. These can sell for upwards of a million dollars because of their spacious interiors, modern aesthetic, and high-quality touches. Throughout the Inner City area, you'll find a mixture of old and new condo complexes. Older buildings host a series of comfortable suites that can be purchased for an affordable price. Cozy, convenient, and well-cared for, these condos make an ideal home for those looking to purchase their first home, or those looking to downsize. In the Southeast quadrant of the city, find some of the newest condos in the city. Part of master-planned communities, many of these are centred around man-made lakes and feature the latest in architecture trends and modern conveniences. Whether you're close to the buzz of the Downtown core and the Beltline, or whether you're situated on the outskirts of town in direct view of the Rocky Mountains, Calgary condos offer an excellent quality of living. 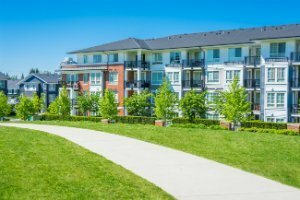 If you choose to live in an apartment style condo, you might find that a heated swimming pool and a private gym are just a few local perks. Given you choose a townhouse style condo, a private backyard where you can garden and barbeque might be one of your favourite features. When searching for a Calgary condo that's close to it all, there's no shortage of great places to choose. With Nose Hill Park in the north and Fish Creek Provincial Park in the south, you'll always be close to walking trails and an appealing natural space. With Shawnessy Shopping Centre, Chinook Centre, North Hill Shopping Centre, and Sunridge Mall, there's no shortage of retailers. As such, crossing items off your shopping list is never inconvenient or out of the way. For more information on where to find the Calgary condo complex for you, contact Team Ken Richter. Ken's been an expert on Calgary real estate for over thirty years.